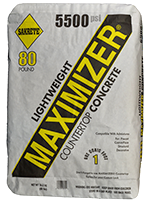 MAXIMIZER White Countertop Mix is specially formulated to create beautiful concrete countertops down to an inch thick with an easy-to-customize white cement and lightweight aggregate. This proprietary blend allows for compatibility with admixtures to ensure superior performance to your specifications every time. Just add water and it is ready to use. Perfect for the experienced professional or the do-it-yourselfer.